Is anyone else in love with smoothie bowls? I've been seeing them everywhere lately and I can't get enough. I saw these Pinterest-worthy smoothies bowls on The Juice Shop's Instagram and had to have one! I spent Saturday morning snapping some photos and sampling their amazing creations. Lucky for us, The Juice Shop owner Paola shared some of her smoothie bowl secrets. You want your smoothie to nourish your body and to do that you need to buy organic ingredients as much as possible. Organic is important because exposure to pesticides are linked to a huge list of health problems. I love that The Juice Shop grows their own herbs and only uses 100% organic ingredients. They also try to source their ingredients locally which is more sustainable and supports smaller farmers. Try heading to the farmers market for your smoothie bowl ingredients! 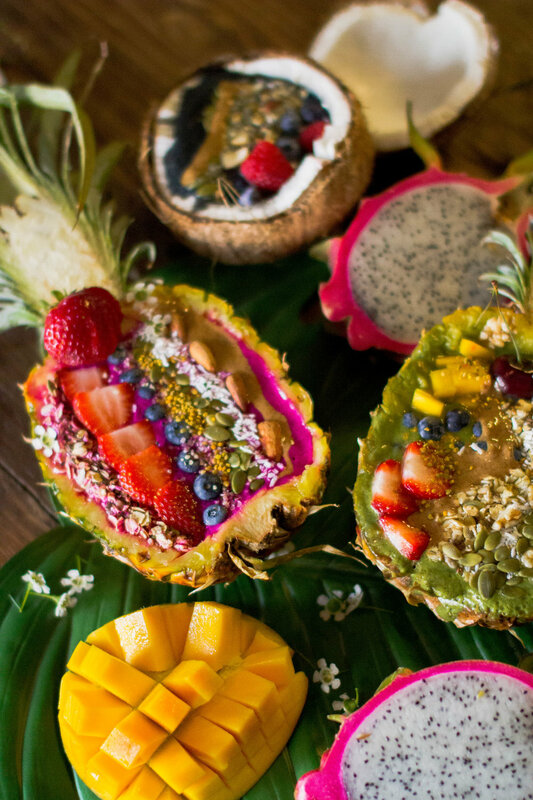 To take your smoothie bowl to the next level you can scoop out the contents of a pineapple, coconut, watermelon, or anything else you can think of and use it as your bowl! Even a beautiful bamboo bowl will make your smoothie look even more appetizing. These bowls give me some serious Hawaii vibes. The Juice Shop was kind enough to share one of their recipes with us so that we can make our own smoothie bowls at home. The essentials for a great smoothie recipe is 2 fruits and 2 vegetables for the base and half a lemon. Don't be afraid to experiment! Pour into a large flat bowl and decorate with your toppings! Your toppings definitely complete your smoothie and it's so fun to get creative. Depending on what toppings you choose they could also add a serious nutrition boost to your bowl. Some topping ideas are: almonds, almond butter, blueberries, strawberries, hemp seeds, coconut, banana slices, cacoa nibs, and granola. I had so much fun tasting these smoothie bowls and learning more about how to make the ultimate smoothie bowl. The bowls in the photos are the Matcha Bowl, Dragon Fruit Bowl, and the Detox Bowl. The philosophy at The Juice Shop is "we are what we eat". They create products made with whole and healthy foods to help us get all the nutrients our bodies need. You can find cold pressed juices, elixirs, smoothies, and more online and in store. In October I am going to be doing a juice cleanse and I can't wait! Everything is gluten-free, peanut-free, hypoallergenic, soy-free, and dairy-free. Make sure to check them out!